You are here: Home / General Real Estate / Does the Baby Convey? Seen in an MLS listing in Charlottesville this evening. Not to take away from Athol, but this one’s pretty good. Heh – that’s the ultimate in cute-and-fuzzy marketing! Not only does this kitchen smell like fresh baked [cookies|bread|pie], but it comes with a baby! My last seller’s agent, Merv Forney, worked a picture of my son into the virtual tour. The 2-year-old was trying to get into all the pictures, so it was inevitable that a shot of the kitchen included him, but he also believed showing a kid in the photo would help people imagine themselves in the home. 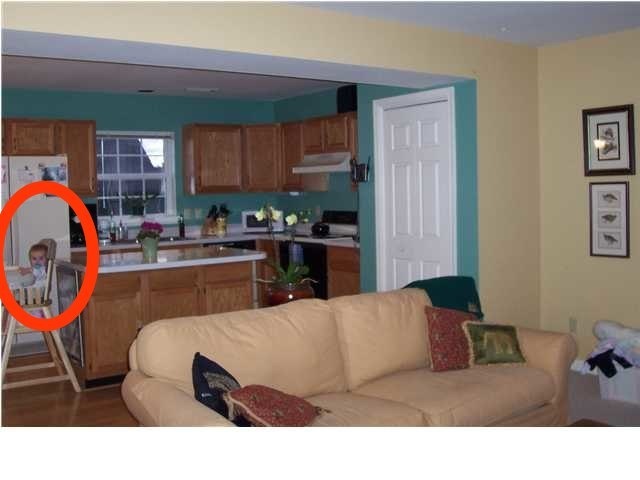 Our home was in Northern Va in summer 2007, and we got a lot of showings and it went under contract in two months, so maybe this agent who “forgot” to crop out the baby is cleverer than we think! On the opposite end of things, consider how much harder it is to sell an empty house. To me the consumer, empty houses mean pending foreclosure or corporate buyback, desperate sellers, and neglect: all things that drive down the price I’m willing to offer. We visited one house for which the seller’s agent had rented or bought furniture (of course, this place has been on the market for over a year now, so I guess it all depends on the house). The house I bought would not have sold nearly as well if it had been empty… at least not without them hiring someone to clean and paint A LOT! When they got it ready to show they bought the cheapest white paint they could find and painted Around the existing furniture.